Earlier this morning we told you about the Cadillac CTS Convertible by CBI, mentioning it was a four door convertible which was "something rare for a convertible in this class." Inadvertently, we opened up a can of worms with that little phrase. Never one to let a little comment pass, Nick2ny asked us to name another four-door American convertible in this class. That involved a little work because, from the major manufacturers, we don't have much. American four-door luxury convertible? 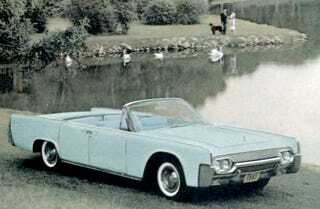 The best we can do is the 1961 Lincoln Continental convertible, which retained all four doors and a soft top that slipped all the way back into the trunk (a la´Skyliner). So that's one. If you stretch the definition you can think of a couple of modern American four-door convertibles, but it is quite the stretch. So here are the questions: Can you think of any four-door convertibles from any period and any country? Can you find anymore custom four-door chops like the CTS? Is a four-door convertible even a good idea? Would you want want/drive one? Four doors + no top. Go crazy.